Savvy wine drinkers will be familiar with this LCBO gem, as are the many restaurants that offer it for house red (often at more-per-glass, than the bottle price). 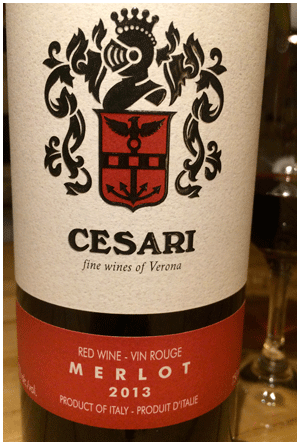 If you have never experienced Merlot from the North of Italy, let me explain how it differs from the California edition. Much lighter and lower in alcohol (12% as opposed to 14%). Less smooth – more gutsy, tangy, dry. Rustic, earthy. The traditional Italian restaurant feeling – lively wine for everyday foods. Gusto drinking and eating. Which is not really the context for a big Calif Merlot. While this wine is a perfect wash down for tomato pastas, you may also enjoy its refreshing nature in the pre-supper slot. Italians like their reds with a refreshing edge – to stimulate the appetite. Lightly chilled, of course. Great Contest! Great Wine App!